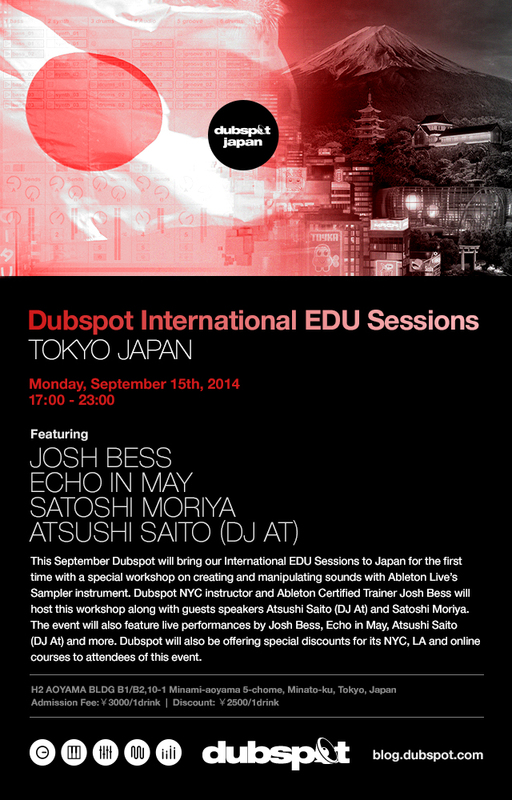 On Monday September 15th Dubspot heads to Tokyo, Japan for an Dubspot International Ableton Live EDU Session where instructor Josh Bess will present a workshop on Ableton Live 9′s Sampler instrument with special guests. Dubspot International presents the first Dubspot International Ableton Live EDU Session in Asia. Dubspot NYC instructor/Ableton Certified Trainer Josh Bess will present ‘Manipulating Sounds with Sampler / Creating your own custom synths with sampler / Creating your own personal sound using any sound in the world as oscillator.’ Guests Atsushi Saito (DJ At) and Satoshi Moriya will also present. The event will also feature live performances by Josh Bess, Echo in May, Atsushi Saito (DJ At) and more. Dubspot will be offering special discounts for its NYC, LA and online courses to people who attend as well as one free online course.